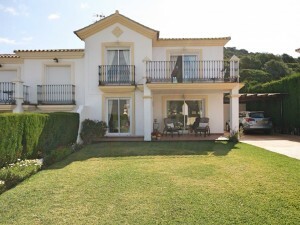 Beautiful semi-detached Villa located in a gated community with paddle tennis and football basketball courts. Ground floor: Entrance hall with guest toilet; large, independent and fully equipped kitchen; living room with fireplace and access to the porch. Storage room under the elegant staircase that leads upstairs to the bedroom area. First floor: 3 double bedrooms with fitted wardrobes and 2 bathrooms. Master bedroom with bathroom en suite (with bath and shower) and access to a beautiful sunny terrace with open views. Upper floor: small attic with large sunny terrace with 100% privacy and panoramic views. Exterior: Nice front patio with seating area with afternoon sun. Private parking for one car more spacious car parking in communal areas of the enclosed grounds. Storage room on the side of the house where you also have access to the large backyard ideal for barbecues. Property in excellent condition with marble floors, double glazed windows with shutters and bars, air conditioning hot & cold in the living room and bedrooms. Very good maintenance of the gated community with ample parking, beautiful 3 pools, gardens, football and basketball courts and another of paddle tennis court. 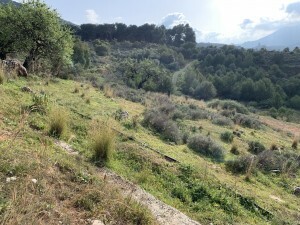 Plot 230,36m2. Built size 132,62m2. IBI 706,02? per year. Rubbish127,73? per year. Community 95? month. Supermarket, shops and bars 2km.